Tests and Working from Observing Position, and Number of Cells to be Used. 127. It is assumed that the cells are in good condition, and of the standard of good Leclanche cells. It is undesirable to use unnecessary battery power, as by doing so the working parts of the dials are much hammered. (1.) With the length of cable and lead. (2.) With the condition of the instruments. (3.) With the condition of cables, leads, &C., though of this there should never, normally, be any question. This number will be ascertained as follows, the sending instrument being worked at a reasonably fast pace, the highest speed, in fact, used in practice. Test for the “minimum” number of cells with which the dials work with certainty, each dial separately. Of the two results obtained, take the highest as the “minimum” to work upon. 14 cells are found necessary for engine dial. 13 cells are found necessary for steering dial. Take 14 as the “minimum” to work upon. Add eight cells to the “minimum,” and test again. Subject, however, to the proviso that in no case should the total number of cells exceed the equivalent, taking into account the resistance of the cables, of about 28 cells direct on the dials. Add six cells to the “minimum” ascertained as above. The “margin” of cells should not, ordinarily, be allowed to remain below eight. If below this figure the cause should be investigated. If traced to one of the instruments, the latter should be examined as described later, and if the fault cannot be remedied it should be reported, and a spare instrument, if available, taken into use. Dials have been known to work with a “margin” of only two cells, i.e., one call added to the “minimum” for the working number, but it would not be advisable, except in the case of emergency, to work with a less margin than four or five cells, and care should then be taken not to work too fast. (1.) Once in 6 months. (2.) When necessary on other occasions, e.g., when the apparatus has any appearance of working unsatisfactorily, when instruments have been changed or overhauled, cables changed, &C.
Cases might occur, however, where it would be advisable to allow or this difference in the event of having on an emergency to work with a very small “margin,” and if the number of cells required for each dial differed abnormally. (2.) In the event of circumstances pointing to the dials being at fault. These tests will be made in the engine-room, with leads direct from the battery, eliminating all cables, &C.
The sending instrument can be used if known to be in thoroughly good order, or a couple of keys can be inserted in the circuit. Each dial will be tested separately (the bell being included with the engine dial). The contacts will be made, as before, at the highest speed likely to be used in practice. Each dial will be tested for the “minimum” number of cells, and the “margin,” precisely as described above. The “minimum” number of cells required for the dial under test will in this case be carefully noted. Engine dial and bell… 15 cells. the dial will be examined as explained later. If this examination and treatment does not put the matter right, the dial will be returned for repair, and a spare one, if available, taken into use. Though it is desirable that a dial not meeting the above tests should be however, follow at all that it is in unsafe working condition. It can be retained in use, if required, so long as the conditions laid down with regard to tests for number of cells to use are complied with. (a.) Detonator, torpedo, small flange (Mark III. ), 77 grains. These are issued five in a tin cylinder. (b.) They may be stored at the installation in a dry, cool situation. They must be kept under lock and key apart from other gear, and always away from other explosives. (c.) In accordance with paragraph 860, Regulations for Army Ordnance Services, 5 per cent. of all torpedo detonators in store over 2 years old should be returned to Woolwich for inspection every year, as they cannot be proved locally. Telegraph Apparatus – Treatment and Testing. 124. The electrical connections of the telegraph gear are dealt with in paragraphs 45 to 51, and the manipulation and daily tests in paragraph 76. (1.) Cables, connections, battery, %C. (2.) Flexible cable and its connections. It is absolutely essential that all cables, leads, connections, &C., should be kept in perfect order. Many apparent failures, or peculiar actions of the dials, have been due to defects external to the instruments. It is, of course, equally essential that the battery should be kept in thoroughly good order. This is especially the case when testing, as, for simplicity, the number of cells is made the basis of the tests. “Minimum” number of cells, by which is meant the lowest number of cells with which an apparatus works satisfactorily under given conditions. “Maximum” number of cells, i.e., the highest number with which an apparatus works satisfactorily. In some cases, with apparatus in first-rate order, this “maximum” may be very high, and it will often not be reached in testing. “Margin of cells,” i.e., the greatest number of cells added to the “minimum” in accordance with the instruction for testing, with which an apparatus is found to work satisfactorily. If the “maximum,” is low enough to come within the scope of the tests, the “margin” will be the difference between the “maximum” and the “minimum” number of cells. Various circumstances may cause the minimum number to increase, or the maximum to decrease, thus reducing the margin within which the instrument works satisfactorily. It is this margin which is chiefly important; variation in the absolute values found for “maximum” and “minimum” is not in itself usually material within considerable limits, provided that the “margin” remain sufficient. 126. The pressing of all four buttons together has a great polarizing effect on the battery. This practice is unnecessary. The only object for which it might be employed, viz., to ensure the right pair of buttons being pressed at a critical moment, can be equally well and more conveniently attained by pressing each pair in rapid succession. 122. (a.) Service primer tubes, containing dry guncotton, will be stored in compliance with Magazine Regulations. It is usually most convenient to store them in the nearest submarine mining dry guncotton store. Arrangements will be made for their satisfactory storage at the installation, on mobilization, during such time as any torpedoes may not be actually primed. (b.) Primer tubes are interchangeable, but a tube should be allotted to each torpedo, and, after it has been tried in position, should have the number of that torpedo painted on it before it is put away in the magazine. (c.) The instructions for the examination of primers are given in paragraph 611 to 620, Regulations for Army Ordnance services. Paragraph 633. The Brennan torpedo primer is enclosed in a brass cylinder with the lid secured with cement. It may be opened by standing it head downwards on some cotton waste soaked in hot water, and then drawing off the head in a vice. It is closed as in paragraph 621, using Pettman cement instead of beeswax. Paragraph 634. In addition to the test for free acid, 5 per cent. of the Brennan torpedo primers will be returned annually to Woolwich for proof, if transport is available; if not, the guncotton from the primers selected will be burnt out locally, to ascertain if dry. (e.) To carry out these regulations, the guncotton of one primer tube at each installation should be renewed annually; guncotton for renewals should be included in the annual estimates of stores. Pettman cement should be demanded from the Army Ordnance Department in quantities of 4 oz. as required. (f.) The primer consists of about 20 oz. of dry guncotton in 1 ¼ inch by 1 ¼ inch discs of 1 oz. each. The disc in the cap has a hole bored in it to take the detonator, and a dummy detonator is placed in each primer to keep this disc in position and to make the tube airtight. 118. Any damaged parts which cannot be satisfactorily be repaired locally, or which it is not considered advisable to send out for repair, should be returned to the Brennan Torpedo Factory for repair or replacing as the case may be, the requisitions to repair or replace being dealt with as detailed in Regulations for engineer Services, paragraph 961B. 119. Depth or steering mechanisms requiring repair internally will invariably be returned to the Brennan Torpedo Factory. 120. The only peculiarity of torpedo cells is their special shape. They are of the Le Clanchè type. It may be pointed out that the rough test of reddening a wire is not altogether to be relied on. It is found that a cell may redden momentarily but polarize so quickly as to be practically unserviceable. Service cells. – Service cells are now issued without sal ammoniac, and with the filling and vent holes sealed, so as to obviate the possibility of any action due to damp. The filling hole is closed by a cork, as usual, the vent hole by a wooden plug, each being coated with shellac varnish, thereby practically hermetically sealing the cell. Attached to the cell is a loose vent plug. When required for use the cork and plug will be removed and a warm saturated solution of sal ammoniac added. The temperature of the saturated solution should be about 105 to 110 degrees Fah. The same cork can be used for re-closing, the filling hole, but the wooden plug closing the vent will be replaced by the cane plug attached to the cell. Twelve service cells should be used annually in practice, or, if for any reason this cannot be done, should be filled and tested. The cells will then be converted to practice cells, and service cells to replace them will be demanded. The cells used will be those which have been longest in store, and for this purpose the batches of cells will be labelled with the date of receipt at the station. Practice cells. – Further, if the existing supply of practice cells at stations, together with the 12 taken annually from the service cells and the establishment of spare parts, is found insufficient for practice purposes, the necessary extra supply will be taken from the oldest service cells as above, and new service cells demanded. Practice cells will thus never be demanded, and but few parts. Practice cells will not, however, be unnecessarily expended, and serviceable and undamaged parts will be used to remake others. When the cell is complete except the closing, fit the teak slabs issued for the purpose on the top of the cell, putting the ring for the cork, and cent tube, in place. Then pour over the top pure molten pitch. The pitch must be mineral pitch, not vegetable pitch which is too soft and runs with slight heat. Finish the top of the pitch with a hot iron. Storage. – Cells will be stored in precisely the condition in which they are received, except that if the shellac varnish on the cork and plug has been cracked at the joint in transit or unpacking, another coat should be put on to seal the joints. The cells will be stored standing upright in as dry and cool a place as possible, and never in the torpedoes. 121. Charge chambers will be treated as described under Regulations for Army Ordnance Services. Paragraph 705. When received into store these charges will be carefully weighed and their weights compared with those marked on the charge chamber; the inspection will be repeated at the end of September in each year in temperate climates, and at the end of March and September in each year in tropical climates. Paragraph 706. Before weighing, the closing plug should be unscrewed to allow the escape of gas. Paragraph 707. If the loss of weight from escape of moisture reaches the limit allowed, cos., 2 per cent., sufficient carbolic solution (prepared in accordance with paragraph 642) should be added to make up the deficiency. Paragraph 708. Should the weight have increased beyond the limit allowed, viz., 2 per cent., it shows that moisture has leaked into the case. This may render the guncotton unfit for use, and the charge should be returned to Woolwich, but at stations abroad it will be left to the discretion of the Officer in charge either to unload, test and repair the chamber and reload it will fresh guncotton, or to return the charge chamber to Woolwich for examination. (b.) Attention is drawn to paragraph 639, Regulations for Army Ordnance Services, by which the closing plugs shall be removed once a quarter to allow the escape of gas, and then immediately replaced. (c.) Great care must be taken, when handling charge chambers, that the studs are not damaged. Whenever the charge chamber is detached from the torpedo, or when the bow block is removed for any length of time, even when the charge chamber remains in place, the wooden blocks issued with it should be put on. They will also always be put on when charge chambers are packed for return to Woolwich, or being weighed, the weights recorded being inclusive of the weight of the block. (d.) The charge chambers now being issued to stations on conversion to .07 wire (torpedoes 101 to 200) are known as Mark II. long, and are made up to a weight of 364 lb. by varying the amount of guncotton. Approximately each charge consists of 230 lb. of wet guncotton. Everything was very very strict when it came to the torpedoes. Security was very high but so were the rules and regulations of working with them! Wasn't Captain Scott (Antarctic) a Torpedo Officer? IV. – Supply, Repair and Care of Torpedo Stores. 108. Instructions for the demand, supply and accounting for stores are contained in Section XVIII., Engineer Services. Paragraph 961A. – Annual Estimates, in duplicate, on army Form G 895A for special stores connected with the Brennan Torpedo, will be forwarded to the Inspector-General of Fortifications by the 1st September in each year. If the estimate for any item is exceptional, either in quantity (being materially in excess of the “average annual issues”) or in the nature of the article estimated for, explanation should be given on the estimate form, or in a separate letter if necessary. Paragraph 961B – Requisitions for such special stores as are supplied by the Brennan Torpedo Factory, to complete establishments, will be sent direct to the Superintendent of that Factory. The requisitions should be on Army Form G 997, singly if in copying ink, otherwise in duplicate. The first six columns and the column of remarks will always be filled in. Urgent requisitions, of urgent items on a requisition, should be so marked in red ink. Requisitions will be made as soon as possible after the 1st April in any year (of before if the necessity arises), but may continue to be sent in at any time throughout the year as may be necessary. Frequent small demands will, however, be avoided as far as possible. The requisitions should invariably show whether the stores were approved in the annual estimates, or of any other stores materially in excess of such estimate, the requisitions will be submitted to the Inspector-General of Fortifications with an explanatory report. Paragraph 1002A. – A list of such special stores as are supplied by the Brennan Torpedo Factory which have become obsolete, worn out or unserviceable, will be furnished from each Brennan Torpedo Installation, annually in April, to the Superintendent of that Factory, who will communicate instructions as to the disposal of the stores on the list. In the case of articles worn or damaged, particulars should be given in the column of remarks as to the nature of the damage, &c., with the opinion of the Station Torpedo Officer as to whether the articles are beyond all possibility of repair. Paragraph 1014A. – The cases issued from the Brennan Torpedo Factory will be identified by numbers figured on the outside, and by the distinguishing mark notified in instructions issued to Officers in charge of torpedo installations. All cases used for the return of gear from stations should be addressed “O.H.M.S., C.O.O., Chatham,” and not to the Superintendent, Brennan Torpedo Factory. Brennan Torpedo Factory cases will be used when available. These usually have a reversible label with the correct address and distinguished mark on the reverse. Should this not be so, or in the event of other cases being used, an identification number and the distinguishing mark will be clearly painted or branded on the cases, which will be addressed as above. Empty Brennan Torpedo Factory packing cases will be returned to the Brennan Torpedo Factory precisely as laid down for cases containing gear, receipt and issue vouchers being sent direct to Superintendent, Brennan Torpedo Factory. At stations abroad, however, if the cases are of little value, they may be disposed of locally, under paragraph 343, Regulations for Army Ordnance Services. Cases should be returned as early as possible after they are unpacked, more especially in the case of special cases, metal mast stay boxes, and rubber boxes (when issued), &c.
All cases, empty or otherwise, packed inside other cases, should be given identification numbers, when it is intended to voucher them as “cases,” the number of every case vouchered as such being entered on the vouchers. The “in transit” vouchers, or notes, passed between the Superintendent, Brennan Torpedo Factory, or the Commanding Royal Engineer, and the transport departments, or carriers, will describe in general terms only the contents of each case. 111. On the arrival of torpedo gear at a station it will be unpacked in the presence of the Station Torpedo Officer, who will ascertain that all parts are present and correct, and, in the case of secret mechanism, that the seals are unbroken before taking it on charge. The receipt vouchers will then be signed by the Station Torpedo Officer, countersigned by the Commanding Royal Engineer, and returned to the Superintendent, Brennan Torpedo Factory. 112. The transport of stores connected with torpedo installations is dealt with in the Regulations for Supply, Transport and Barrack Services, 1899. Paragraph 165B. – Torpedo and gear connected with them being issued form, or returned to, the Brennan Torpedo Factory, Chatham, will, as a rule, be sent by water, but and transport may be used when necessary for the due preservation of secrecy, or in cases of emergency, or when more economical. Paragraph 166 )b.). – In the case of Brennan torpedo stores in direct consignment, the Superintendent, Brennan Torpedo Factory, or the Commanding Royal Engineer will arrange, as may be necessary, for any portion or parts to be specially taken charge of by an Officer of the ship, and will detail a member of his staff to see that the cases are properly taken over and to obtain a receipt from the Officer of the ship or Transport Officer. Separate bills of lading will be used for these stores. 114. In the case of depth mechanisms becoming defective, they will, unless the number exceeds two, be returned to the Brennan Torpedo Factory in the personal charge of an Officer. Others to replace them being taken from the factory to the station, in a similar way, advantage being taken, when possible, of Officers proceeding on leave or duty. In case of the depth mechanisms exceeding two in number, special steel cases with two different locks are used, the two keys being sent separately by registered letter post. The receipt for the first key being awaited before the second is sent off. One of these keys is to be given to each of the two persons who have the custody of the keys of the torpedo installation safe, and are to remain in their custody until returned to the Brennan Torpedo Factory (see paragraph 4). In opening and closing this case, and in taking out and putting in depth mechanism, the same rules are to be observed as regards the attendance of both the authorized persons who have custody of the keys, as are in force with regard to the depth mechanism safe (see paragraph 4). 115. Steering mechanisms should be packed in strong cases, which should be sealed. 116. The greatest case is to be taken in packing stores returned to the factory to obviate damage in transit. Precautions should be taken to prevent rusting while in transit, and, from distant stations, torpedoes, charge chambers, &c., should be treated as described in paragraph 33, for torpedoes remaining long unattended to, except as regards the quicklime which may be omitted. No gear should ever be packed in empty wire cases. 117. The “in transit” vouchers, or notes, passed between the Superintendent, Brennan Torpedo Factory, or the Commanding Royal Engineer, and contents of each case, but, in the case of gear of a confidential nature, is to be entered on these vouchers. No reference to the Brennan Torpedo Factory will appear on these “in transit” vouchers. 95. Before dealing with the method of engine driving, two portions of the machinery of the engine room require short notice, viz., the condenser and the reducing valve. (1.) To prevent the consequences of exhausting into the atmosphere, viz., showing up the position of the installation and the moment of launching, and possibly inconvenience and obscuring of view. (1.) Was the primary object for which condensers were originally provided, and calls for not particular remark. (2.) Is of greater importance than formerly on account of the greater power required. Ejector condensers are being gradually replaced by surface condensers. 97. The manipulation of the condenser will vary somewhat with the local arrangement. The best means will be adopted to avoid any sudden variation in the vacuum; a steady rise or fall with which the automatic stress regulator can deal is of no importance. 98. With the ejector condenser it will be part of one man’s regular drill to attend to the condenser during running. He will turn on the condensing water the instant the order to launch is received in the engine room, and will, if necessary, regulate the supply during the run, so as to keep the best and steadiest possible vacuum. He will be ready to shut it off sharp on a wire breaking or the engine being stopped at any time, and to start it again on the order to go ahead being received. At the end of a run he will shut off as the wires are being wound in. 99. With the surface condenser it will probably be found best to keep the water circulating when there is any probability of a torpedo being launched. The rate of pumping must probably be increased when the torpedo is actually launched; in this case steps should be taken to obtain constant results by always opening the throttle valve of the pump to the same extent. 100. Reducing valve. – It is only necessary here to refer to the setting. At each station the setting required to give the running stress at the commencement of the run, and the adjustments of the special contact-breaker which give that setting, should be found and noted. These adjustments should be known for running with and without the condenser, as considerably less steam pressure is required in the former case. In any cases of uncertainty, it is always preferable that the initial setting should be slightly low rather than high, as wires may thereby be saved, and the stress regulator will soon give the desired stress. 101. The method of engine driving has been much simplified by the introduction of the automatic stress regulator, but a few points call for notice. Launching. – A tachometer should be used for driving at the start, and it should be seen that it is reliable and that the belt driving it does not become slack. The revolutions which give the vest launching speed should be found for each installation and adhered to. A high speed is usually best as regards diving of the torpedo, but this speed has to be limited on account of the danger to the wire from the sudden stress on the propellers striking the water. The engine driver must be instructed to adhere strictly to the revolutions determined on for starting. Care will be taken that he does not make the mistake of starting the torpedo when the engines are at the correct revolutions, and then allowing them to accelerate while the torpedo is running down the slipway. 102. When running on the surface is necessary, the number of revolutions to drive at while the torpedo is on the surface after the carriage is out should be found by trial and adhered to until the order “Full Speed” is received. This surface speed should be such that the torpedo takes its depth with certainty, and not high enough to cause undue rises of stress on the wire. It may be found possible, and in that case most convenient, to fix the same number of revolutions for running on the surface as the starting speed. 103. Full speed. – When full speed is put on, the engine driver will open the throttle to the full extent at once and leave it there. Under ordinary circumstances he should not interfere with the lever again until the end of the run. He will, however, remain sharply on the look-out for further orders on the dial or for a wire breaking. Should the latter happen, he will stop as quickly as possible, using the break. Should he get the order, “Stop,” on the dial, he will at once shut off steam, but not use the brake. Should, however, the order “Stop2 be followed immediately by the order “Connect Up,” the engine driver will at once slow down, but will keep the engines moving until the man at the steering wheel has brought the steering pulleys central. He will then stop as quickly as possible. 104. Though the stress regulator renders the dynamometer scale and pointers unnecessary for ordinary purposes, they are left on for driving at half speed, and also as a stand-by, to enable a run to be safely completed even in the event of the stress regulator being out of action. 105. The engine driver will glance at the pointer from time to time, and if he notices an abnormal rise of stress maintained to a dangerous extent, showing that the stress regulator is not working, he can take charge with the throttle. He must then drive with the lever for the remainder of the run. It is desirable that engine drivers should very occasionally drive during a run without the stress regulator, in order that they may be trained to meet this emergency. 106. Half speed. – Irrespective of running on the surface at the start, &c., it may become necessary, under special circumstances, to run for a short time at half speed in the course of a run. In that case the engine driver will take charge and drive by the stress. He will adhere strictly to the stress fixed on for half speed, which will be a safe margin below the stress at which the main contact maker is adjusted to bring the stress regulator in and out of action. This stress should be clearly marked on the dynamometer scale. On “Full speed” being given after running at half speed, he will at once throw the throttle wide open, as when giving full speed at the start. 107. Winding in. – When the tail ends of the wire are wound in, as in an ordinary practice run, they are less likely to become damaged if wound in at a high speed. The engines should, therefore, be allowed to run at full speed when the wires are off. A mark should be made on the diagram, before the run, to indicate the ends of the wires. As this mark is approached, the engines should be slowed down and the ends brought in dead slow. (1.) The vessel, when in position, will hoist a flag to show that she is ready for the run. (2.) When all is ready for launching on shore, and the coast is clear, a flag will be hoisted near the directing point. (3.) This will be the signal, if a target is used, for the towing vessel to steam on the course ordered. The directing point flag will remain up if the torpedo is launched, but will be lowered if, for some reason, the launch does not take place. (4.) The towing vessel will strictly follow her instructions as to course, both before and after the torpedo has passed. These instructions should, as far as possible, be such that if the towing vessel picks up, she should be somewhere near the torpedo at the end of the run. (5.) At the end of the run the flag at the steering point will be lowered, and the picking-up vessel will lower her flag and pick up the torpedo. (6.) If the word “Cut” is signalled and the flag at the directing point lowered, the vessel will lower her flag, approach the torpedo, and cut the wires. (7.) The vessel will on no account approach the torpedo while either her own of the directing-point flag is flying; subject, however, to the proviso that, if the torpedo is not moving, and is seen by the vessel to be in a sinking condition or dangerous position, she will steam towards the torpedo, calling the attention of the directing point by continuously raising and lowering her flag, whistling, or any other means in her power. Even under these circumstances, however, she should not go alongside the torpedo until both flags are lowered. (8.) At night an easily distinguishable light should be used instead of the flag at the directing point. It is advisable that the vessel should carry the recognized towing lights when towing the target, and some special light (such as a flare) should be arranged for the signals under (1) and (5) which cannot be mistaken for Board of trade or local recognized signals. The foregoing may not be applicable to the circumstances of Defence Practice, for which special rules should be made to meet the case. 93. As far as possible the run should end near the picking-up boat, not only in case pf the torpedo being in a dangerous condition or position when the wires are off, but also so that there should not be necessary delay in getting the torpedo out of the water. A torpedo is always liable to take in some water when lying on the surface, owing to there being no pressure on the door rubbers and no wires through the sponge bush. Pole, 10 or 12 feet long, painted at one end. A second towing line in rough weather. One cork buoy, attached to a sinker by a light line of sufficient length, according to the greatest depth of water on the vicinity and the strength of the tide. One similar line attached to a buoy, but without the sinker. An eye is formed in one end of the towing line, through which the other end is rove, forming a loop. The pointed end of the pole is put into the eye, thus jamming the line in the eye. A man takes both pole and line, keeping a slight strain on the line, and drops the loop over the nose of the torpedo; then, by pulling both pole and line together, withdraws the pole ad tightens the loop. The launch should just keep steerage way on, and should approach the bow of the torpedo, as otherwise the loop is liable to get over one hook of the nose only. In the event of the torpedo being waterlogged or drawn under by the tide after stopping, the picking-up vessel should use every endeavour to make fast and free end of the buoyed line to any part of the torpedo, mast, stays, &c., the torpedo may thus possibly be prevented from sinking; if not, the buoy shows its exact position. If this cannot be done, the sinker, with line and buoy attached, should be dropped as near as possible where the torpedo disappeared. In towing the torpedo it is convenient to pass the towing line over a notched spar projected from the stern of the vessel, and to haul up the torpedo fairly close to this, so as to prevent the chance of overrunning and damage. On the launch nearing the landing point, the torpedo can be handed over to men in a dinghy. Torpedoes are often unnecessarily damaged in picking up and landing. The necessity for great care must be impressed on those engaged in the operations. 94. The usual precautions taken in practice must be particularly strictly carried out in night running. The lamp connections will be carefully tested. If the lamp goes out or becomes invisible and the torpedo cannot be otherwise clearly seen, the torpedo will be stopped. A signal will be arranged for the engine driver to give notice to the Directing Officer, by means of the buzzer or bell, as the case may be, that the wires are off, as the Officer can only know that the light has disappeared and does not know the reason. Any points of interest that arise should be noted and reported. 86. The sooner the Directing Officer is able to see the torpedo after the launch, the better. He should in any case, as far as possible, avoid giving a steering order until the torpedo is in his view. It may not, of course, always be practicable to follow this implicitly. 87. Diving on steering is usually worst at the commencement of a run and may be intensified if the torpedo has not settled down after its first dive or heel on launching. It is not, therefore, advisable to steer just as the torpedo enters the water, but if it is necessary the helm should be put on as gradually as possible. This must depend considerably, however, on local considerations, and the conditions of the particular run. 88. If a torpedo dives badly on steering, so that the mast disappears, it is advisable, if the circumstances permit, to slow down the engines and ease the helm. It is not worth while running unnecessary risks in practice. 89. In the class of shot most generally practiced – a vessel approaching to run past installation – the error is frequently made of waiting too long, so that the target is met when opposite, or even past, the slipway, the installation then being open to fire. The object should usually be to get the first shot in as early as possible, while the installation is still under cover, and so as to give all the time possible for a second shot. Late and following shots, and all classes likely to occur in action will, however, be practiced. 90. Heavy steering should very rarely be necessary, and should never be unnecessarily employed. The better the judgement of the shot the less steering is required. The object should be to get the torpedo running on a direct line to cut off the target, and slight corrections one way or the other should usually suffice. 91. It is very difficult to judge the true course of a torpedo running in a curve at any distance unless with very high command. It is still more difficult to judge the helm required, and the effect of helm given, when there is considerable bight of wire in the water. It should be borne in mind that a torpedo, with rudders amidships, tends to run in prolongation of the line of the wires from its stern at any moment. When running in a curve, therefore, the lead of the wires must always be borne in mind, as on that depends to a great extent the immediate effect of the helm on the torpedo. There is no doubt that this has not infrequently led to the impression that the torpedo is sluggish in answering the helm, especially when the bight in the wire is straightened, as the torpedo is then constantly tending to change its course, and to move more and more round in one direction as the lead of the wire alters. Large bights in the wire should, therefore, be avoided as far as possible. Though, as stated above, heavy steering should be seldom required, and extreme steering so rarely as to be practically limited to cases of emergency, some classes of shots may be likely to occur (and should, therefore, be practiced), which may necessitate bringing the torpedo round to a considerable extent. The object should always be to effect this with the minimum amount of steering and bight in the wire. The steering should, if possible, be put on gradually, two or three at a time, and then a short interval, and so on. This is particularly important in the case of a torpedo which is seen to vary its depth badly on steering. In this case care should also be taken not to reverse the steering suddenly, as this is particularly liable to make a torpedo, which is already diving on being steered in one direction, come to the surface when the steering is reversed. It should always be remembered that heavy steering, suddenly put on, intensifies many possible sources of trouble, and must necessarily cause severe stresses on various parts. 76. A trial of the telegraph apparatus will be made before each practice run (except when, as in “quick running,” time may not allow) by bringing the pointers of the dials to points which have been prearranged. With the dials arranged as in paragraph 51 a fault in the circuit and with great probability be rapidly discovered and adjusted. Each station has now two sending instruments, and duplicate long and short lengths of flexible cable, and by means of the commutator the main cable to the engine room can be quickly changed and the spare set of dials taken into use. By changing parts of the circuit in succession, the fault can be localized unless it is due to defects in two portions. 77. It will be an invariable rule to press each pair of buttons, in turn, just before giving the “Are You Ready” order for a run, in order to ensure both dial pointers being central to start with. This is of such importance that it is advisable to make a habit of bringing the pointer central, by pressing both buttons together, immediately before any order, where there is a possibility of error or forgetfulness as to the last order given, especially, for instance, before each order on the Engine Dial up to the launching order, as considerable time may elapse between the orders. 78. The actual duties on the receipt of orders in the Engine Room may vary in detail according to local circumstances, but whatever special local rules are made, must be adhered to implicitly, and the general rules given below and under 79 must be followed in principle. The non-commissioned officer in charge is the person responsible for “accepting” all preparatory orders (i.e., up to and including “Stand By”). Although for convenience the engine driver presses the button in answer, he will only do so by order of the non-commissioned officer in charge. Having “accepted” the “Stand By” order, the non-commissioned officer takes post, and the subsequent running orders are “accepted” by the engine driver, who is then responsible for compliance. 79. There must be complete understanding as to the meaning of each order, and of the “acceptance” of each order. “Connect up.” – The reasons for the introduction of this order will be given later (81). In ordinary practice running it may, or may not, be given on the dial according to circumstances. Whenever given, however, it means that the next torpedo to be run is to be connected up as rapidly as possible. The “acceptance” of this order by the non-commissioned officer means simply that the order has been received and will be carried out. “Are You Ready.” – On receipt of this order, the non-commissioned officer will see that the whole of the preparatory work is complete, and the torpedo and gear in condition for launching to take place at any moment; that each man concerned is ready, and standing or sitting “at ease” near his running station. The “acceptance” of the order means that the non-commissioned officer has carried out the order and satisfied himself on the above points. “Stand By.” – Each man will stand to his work, absolutely ready to comply with the launching order without a moment’s further hesitation or delay. The man at the steering wheel must be actually holding it to keep it amidships. The “acceptance” of “Stand By” means that the non-commissioned officer has actually seen the above to be the case, and is himself taking his post, whatever it may be. On the other hand, it is extremely inadvisable to give “Stand By” any considerable time before it is intended to launch, as it is a strain on the men, and leads to their attention becoming relaxed. “Stand By” will usually be given only sufficiently before it is intended to launch to allow ample time for the men (who are already complying with “Are You Ready”) to come to their “Stand By“ position, and for the non-commissioned officer to see that they have done so, and to “accept” the order. This should actually only take a few seconds, but, or course, circumstances may render it necessary to prolong the time during which the men are kept to attention. In fact, strict compliance with “Are You Ready,” and “Stand By,” must be insisted on, but these orders should not be left on when strict compliance is not necessary. 81. The reasons for the introduction of, and the complete meaning of, the order “Connect Up” are as under:- Under service conditions, if, after a successful or unsuccessful shot, there is no chance of a second shot within a short time, it would always be advisable to wind in the wires as being by far the most efficient way of clearing them. This will, therefore, be the rule unless a further order is received. 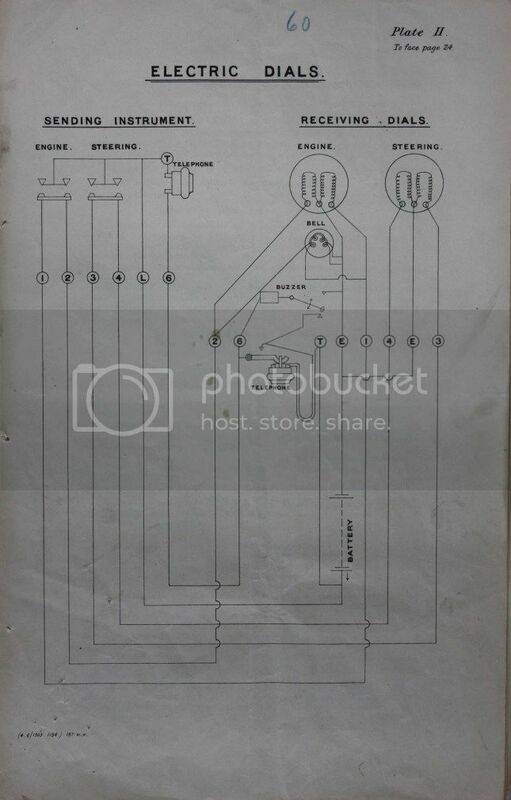 This will mean that the engine driver will stop the engines as rapidly as possible, consistently with allowing the man at the steering wheel to bring his pointer central (see Engine “Driving, paragraph 103),” that the wires will be cut and cleared, and the next torpedo connected up as rapidly as possible. In ordinary practice the “Connect Up” order can be used or not as desired. It is understood to be found a convenience at some installations. 82. It may become necessary to stop the engines at any moment, even when only winding in wire after an ordinary practice run. The order “Stop” should, therefore, never be given when the engines are moving, unless it is actually desired to stop them. It follows that when wires are wound in after a run, “Stop” should not be given until the ends are in. 83. When the order “Stop” is given, it will be repeated until accepted from the engine room. 84. The Directing Officer will invariably give the orders “Zero” on the Steering Dial the moment the wires are off in an ordinary practice run, or, in “Quick Running,” and under service conditions, the moment the run is ended, whether that be by stopping the torpedo, or by a successful shot. 85. It is a matter for decision according to local circumstances whether the “Half Speed” order is used for launching, and the launching speed adhered to until the order “Full Speed” is sent down by the Directing Officer, or whether “Full Speed” is used for the launching order, and the engine driver instructed to give full speed as soon as the carriage is out. The latter course is preferable when there are no special reasons to the contrary. 59. The torpedo will never be directed at a launch, notwithstanding the fact that the depth may have been regulated to ensure the torpedo passing under the keel. 60. Hitting a tow line or target is liable to damage the mast, and a badly damaged mast may have serious results. After hitting a tow-line or target, therefore, or any other obstacle, the torpedo should be most carefully watched, and if any tendency to dive is noticed either when running straight, or on steering, the run should be considered over, the torpedo stopped, and the wires pulled out slowly. The target tow lines will be no stouter than necessary. Unnecessarily heavy lines will bend a mast almost with certainty, and these appear to have been customary at some stations. 61. Running torpedoes in quick succession will be practised. Lengths of wire which have become too short for ordinary practice, and can be actually cut and cleared, as would be the case in action, should be used for this purpose. Useful practice can also be obtained after a long run by stopping the engine just before the tail ends of the wires come in, then cutting and clearing and connecting up the next torpedo. It may not always be necessary to launch the last torpedo if every operation up to that point is carried out. The time from “wires off” till the next torpedo is ready and should be noted. N.B. – The actual fitting up of torpedoes should never be hastily carried out. There should never be an occasion when it is necessary to fit up a torpedo in a hurry. 62. In “Quick Running,” care must be taken that the wires of the first torpedo are well clear of the slipway under whatever conditions of tide and sea may exist. The ends should be retained and pulled in as soon as possible afterwards. 63. To prevent subsequent delay under quick-running conditions, practice or service, the man at the steering wheel must immediately bring the rim pointer of the steering dial to zero, when the order “Stop” followed immediately by “Connect Up” is received. (See also under “Directing Orders,” para. 81, and “Engine Driving,” para. 103). In a run where the wires are wound in, the steering dial will be brought central while the ends are coming in. 64. It should be seen, as far as possible, that the slipway is clear for a sufficient distance below the water level. 65. The D.M. should be set for the torpedo to take its depth on entering the water, unless some condition of depth of water, &c., at the time of running renders it dangerous. 66. The setting, cocking, and safety arrangements of the pistol, and fitting of the primer tube (dummy) must be as carefully carried out in practice as would be the case under service conditions. Care must be taken that a loaded primer tube is never used in practice. 67. There should be some preconcerted signal on the buzzer by which the engine driver may inform the Directing Officer that he wishes to communicate on the telephone. If there is independent communication this want is of course already supplied. 68. Stopping during a run, if ever done in action, would be of such extremely rare occurrence that it can scarcely be considered a service operation. There must always be some liability to break a wire on restarting, owing to fouling of the wire when slack, or to “fuzzing” or kinking at the torpedo. Moreover, there may sometimes be difficulty in the torpedo taking its depth again. The torpedo should, therefore, never be stopped in practice except from considerations of safety to torpedo, gear, vessels, or individuals, &c., or for some other very special reason. 69. The liability to break a wire on restarting is increased by the suddenness of stopping. Where there is no need to stop very quickly, it is advisable to slow down first. In any case the engine brake should not be used in stopping except in case off a wire breaking, or an accident or danger in the engine room, or when the “Stop” order is followed immediately by “Connect Up.” (See “Directing Orders,” paragraph 81, and “Engine Driving,” paragraph 103). Conditions under which the extremely slight additional travel of the torpedo, owing to the non-use of the engine brake, would be material, are scarcely conceivable, and should certainly never be allowed to arise. On the other hand, the slight extra stress kept on the wires while the drums are still revolving may just prevent the wire becoming foul at the torpedo, and this would be of extreme importance if the necessity of stopping were ever to arise in a service run. Practice masts will be used, and, for day running, lamps and electrical connections need not be fitted. Practice wires and drums will be used, except on the first occasion of a service wire being converted to practice. Practice cells will be used for night running. The necessary ballast compensations will be made. Dummy primer tubes will be fitted. 71. The D.M. Hood will invariably be used in all runs. 72. Every endeavour will be made to trace any defect which may become apparent in running. It is far more difficult to trace the cause if any time is allowed to elapse. As a rule, therefore, when any defect or peculiarity is noticed, it will be followed up at once, the succeeding runs being made with this object, until the defect is traced, and, if possible, remedied. 73. ll the personnel connected with the installation must be practiced in the duties they would have to perform in time of war. 74. With this object in view it is advisable that each man should be allotted definite duties, and he should be normally employed on these duties, more especially during “quick running” practices and “defence” practices. Each man should also, however, be trained in all the duties. Military mechanist. – Superintending and checking the operations. No.1 – At observing post with Directing Officer. No.2 – Torpedo Store. Places No.2 torpedo on slipway as soon as No.1 has started; pulls in travelling carriage after run and cuts the wires, taking care that they clear the slipway; passes right wire of No.2 torpedo over fairleads and dynamometer pulley and through right groove of winding drum. No.3 – Torpedo Store. Assists No 2 in placing No 2 torpedo on the slipway and in pulling the travelling carriage; passes left wire over fairleads and pulleys; lifts driving wheel of travelling carriage into position, passes wire through left groove of winding drum, and makes fast both wires. No.4 – Operates steering wheel during run; fastens end of right wire and removes full drum from shaft. No. 5 – Fastens end of left wire, places empty drum on shaft, and sets spreader. The remainder as most convenient, according to the peculiarities of the installation. 46. Where directing cells exist, the junction-boxes should be in the cell, otherwise they should be erected conveniently near the actual directing station in such positions as to be protected as far as possible from damage, either in peace time or from fire in action. They should be adequately protected from weather. 47. Flexible six-core cable should, as far as possible, be used in preference to single core leads for all circuits in the engine room. This should be properly fixed to the walls or carried overhead, and should never pass under the floor or unnecessarily close to steam pipes. 48. All connections not necessitating moveable terminals will be made permanent and soldered. 49. The spare set of dials should be fixed in such a position on the wall of the engine room that they can be seen and used in an emergency. 50. A junction-box should be provided so that the dials can be tested on the engine room without using the main cables. 51. Diagram I. shows a typical arrangement of the lads, &c., in the ending room. 52. Great care must be taken, in the case of the stress regulator and clock leads, that they are quite clear of all moving parts, both when the gear is stationary and also during running. Cases have occurred where the leads, though clear of the moving parts of the dynamometer, have been damaged by the wire itself owing to this point being overlooked. As little of the lead as possible will be left slack. 53. There should be speaking communicating between the directing stations and the installation quite apart from the receivers used in connection with the telegraph apparatus, which are intended to be retained merely as “buzzers” for answering orders, though they can also be used – somewhat inefficiently – for speaking, if necessary. Loud-speaking telephones will probably be most generally suitable, though voice tubes may be preferred in some positions. Telephonic communication may also be desirable between advanced observation posts and the directing stations and installation, but this will depend on local conditions. 54. Practice will be carried out as laid down generally in Instructions concerning Brennan Torpedo Installations issued with Army Orders. Many of the following directions and hints apply equally to service and practice running – it will be clear where this is or is not the case. 55. It is essential for efficiency that practice should take place under the various conditions which may exist in time of war. At the same time every possible precaution should be taken to minimise liability of danger to torpedo, vessels, or individuals. (1.) Get as clear a course as possible before starting. (2.) Avoid practising in thick weather or fog, or when it is so rough that it would be dangerous to make fast the torpedoes preparatory to towing them back to the installation, or to land torpedoes. (3.) Avoid practising at a time when darkness is coming on rapidly, except when prepared for night running. (4.) Avoid unnecessarily steering the torpedoes near vessels, rocks, banks, shoal water, or channel buoys. (5.) Practice at night only under very favourable conditions of atmosphere and weather. (6.) Always have a good steamer ready to toe the torpedoes back, and to not depend entirely on row boats for this purpose. (7.) The utmost care must be taken to avoid fouling any vessels or other craft with the wires when the torpedo is running; there is great danger to life and limb if the wires come in contact with any person. (8.) When there is hidden water near, whence vessels might appear unexpectedly, the Directing Officer should satisfy himself that the coast is clear before starting. If necessary, he should station observers to prevent boats or individuals approaching the wires during a run. (9.) There should always, if possible, be a dinghy near at hand, that can be rapidly manned in case of a mishap, on, or shortly after, launching. The torpedo is then in its worst condition as regards buoyancy, and is also liable to be carried ashore and damaged. (10.) There should always be a good signaller with the Directing Officer, and on the picking-up boat. (11.) Definite orders should be issued to the detached against unnecessarily approaching the wires when the stress is on. A broken wire may inflict most serious injury. Almost the only occasion on which it would appear to be necessary for men to be within range of the wire, under ordinary practice conditions, is when getting another torpedo in position in “quick running,” but this should rake very little time if all is ready beforehand. It should be seen that the guards in the engine-room are efficient, and invariably used when running. 56. The area of water available in time of action in view of surface mines, obstructions, &c., must be taken into consideration. The effect of different conditions of tide weather , “and the man torpedo speed that may be expected for the various classes of shot,” will be noted. The distances of any fixed points within range of the torpedo should be known, as also of any more distant ones which might indicate the range or speed of approaching vessels. If fixed directing stations or positions exist, directing will frequently be carried out from them in practice. 57. Frequent practice at a moving target is essential, as everything depends on the judgement and accuracy of the Directing Officer. The fastest vessels obtainable should be used for towing the target. The course followed by the towing vessel should be frequently varied, so that practice in every class of show may be obtained. For ranges up to 1,000 yards, a 50 yards to-line. For ranges between 1,000 and 2,000 yards, a 100 yard tow-line. Orders to this effect should be hung upon a boar, in a suitable place on all vessels employed on torpedo towing. (2.) The target itself should be aimed at, and no attempt should be made to steer the torpedo between the target and the towing vessel. Thank you for adding the additional information helcion.